Today is RubberMoon's Silver Anniversary! 25 years of spreading moonbeams and sprinkling magic. An anniversary is a day to look back on and celebrate the time that you have put into a event or relationship. I could not let this day pass without writing to commemorate this special time in hopes of conveying my feelings to you, my friends and creative moonbeams. 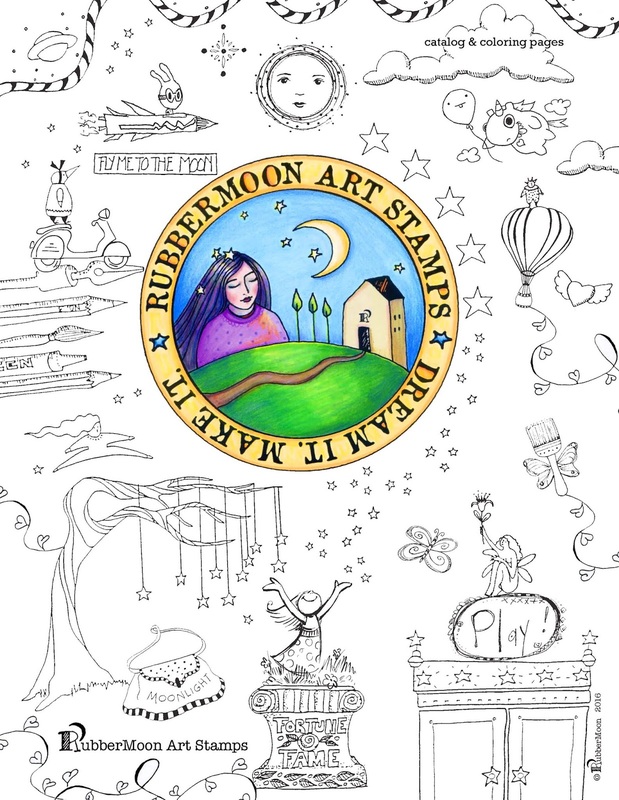 So you see, RubberMoon is so much more to me than just some little company that makes rubber stamps. It is a source of hope, love and inspiration and I hope that it is all of those things for you too! Although I cannot say too much about the first 19 years, I can say that these last six years have been full of excitement, exhilaration and challenges. 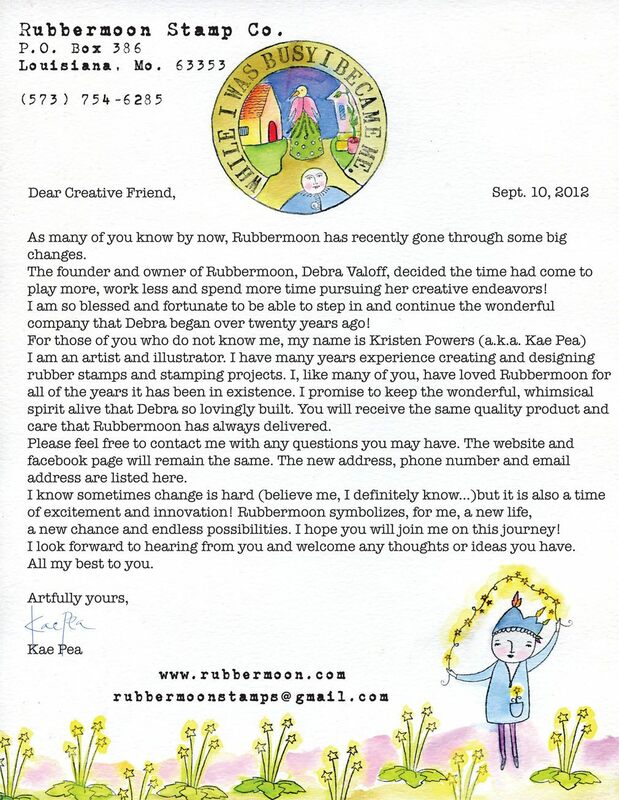 While I have accomplished many of my goals, I still have a lot left on my list of dreams and so, RubberMoon is 25 and we are really just blasting off!! I hope you will continue to stay on this creative journey with us and I am so happy and honored and grateful that you are a part of my orbit! 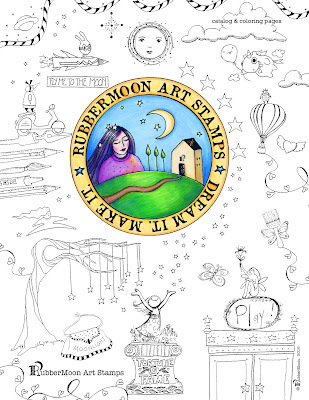 August 1993 - RubberMoon is founded by Debra Valoff in Lake Hayden, Idaho. 1993-2011 - RubberMoon is one of the small stamp companies that stuck around when many others closed their doors! Host to many great artists, such as Marylinn Kelly, Jane Cather, Dave Brethauer, and more. February 2012 - Kae Pea calls Debra V. to ask about having some stamps made. 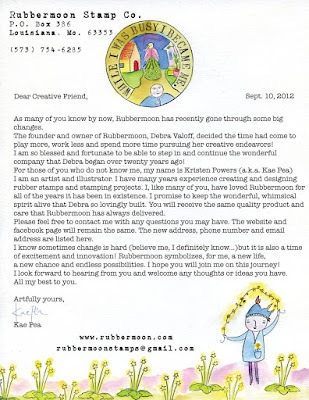 A deal is struck for Kae Pea to buy RubberMoon! 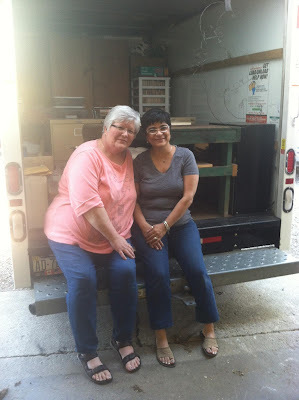 August 2012 - Kae Pea and her sister, Bridgette, go to Idaho to bring RubberMoon to Missouri. September 2012 - RubberMoon opens in Louisiana, Missouri. 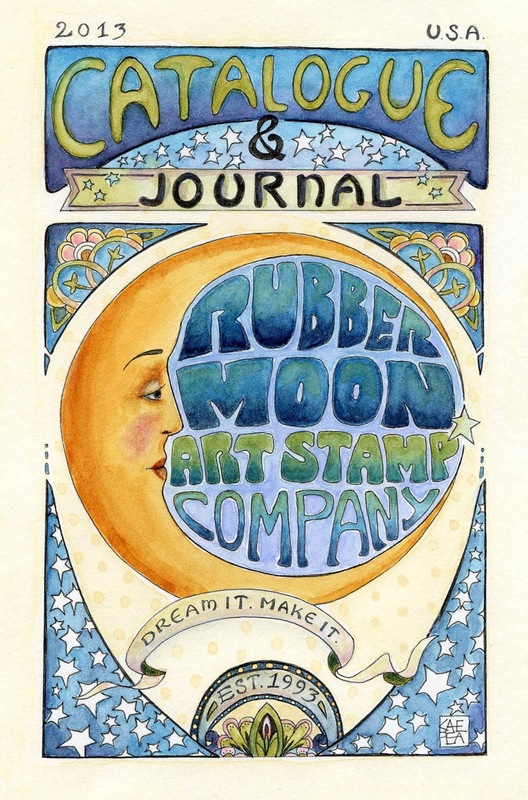 January 2014 - RubberMoon launches a NEW website and the MoonMail Club opens! 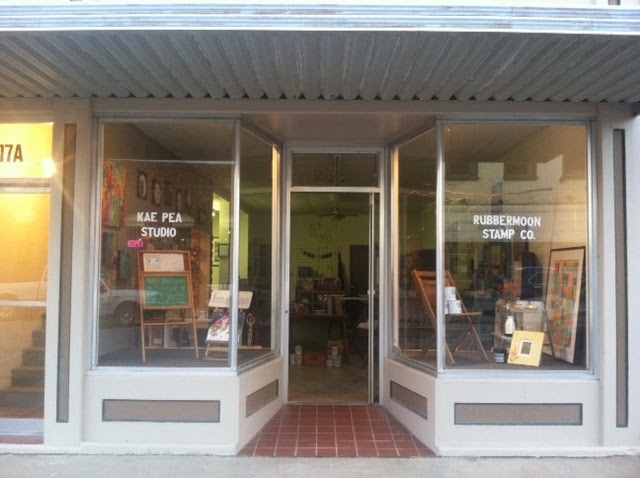 March 2016 - RubberMoon moves into a new building. October 2016 - Mr. 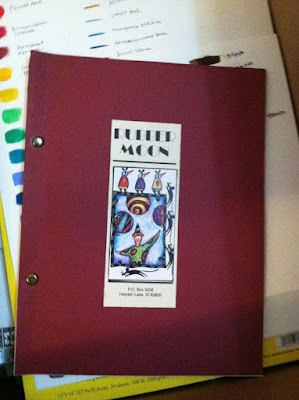 Moon comes to work for RubberMoon full time! June 2017 - Maxi Moon comes to work for RubberMoon! November 2017 - Let's Get Makey is launched! August 2018 - Celebrating our 25th Anniversary! NEW from N*studio at RubberMoon! Hi! Kae Pea here. One of the very best and most exciting part of my job is that I get to work with so many fabulously creative people, who create amazing designs for us to turn into rubber! As many of you know, this month RubberMoon released many new designs with holiday themes. We have been loving them all so much and having so much fun with the great variety of imagery. I have really wanted to make each collection stand out and introduce you to the designs in a way that gives kudos to each artist and helps to make their release stand out, because they sure all deserve their special time in the spotlight! So, today I wanted to share with you the newest offerings from Nathalie Kalbach at N*Studio! 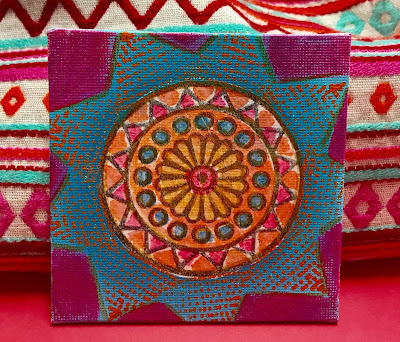 Her super cool ornament designs are so versatile and inspiring. Six 'mandala-like' images and an 'ornament topper' to use as your imagination guides you! Perfect for holidays but so much more! Of course I could easily switch up the color palette and have a completely different look. Just one of the unlimited ways to use this innovative new collection of stamps from Nathalie Kalbach and RubberMoon! 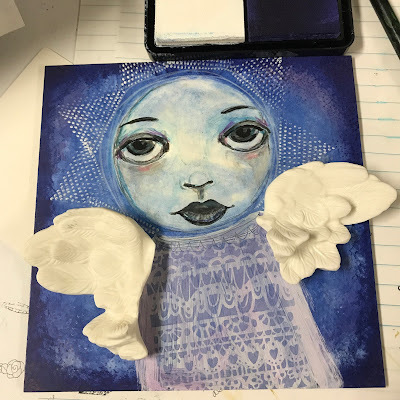 PS - You can read Nathalie's blog post and see more awesome ways to use these stamps from her amazing creative team HERE! It has been so inspiring and such an honor to share the past eleven days of art and creativity with the talented artists and designers from the Relics & Artifacts team. 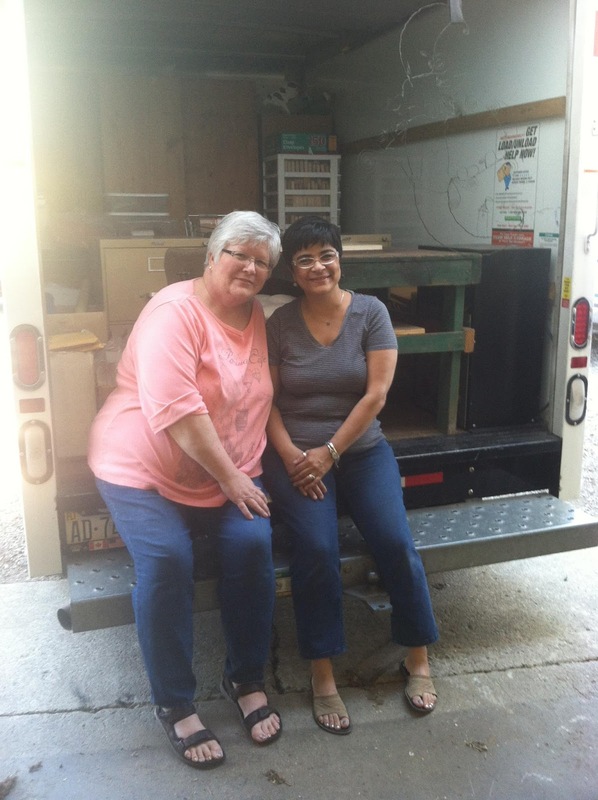 As a little 'encore', Sandra and I decided to team up on this final project! Sandra sent me a beautiful amber, glass, bottle she had re-purposed into an artful, sculptural masterpiece. She envisioned it as an "intention" bottle. She left me the sides and back to work with and I set about adding a bit of my own creativity and energy to this beautiful piece. Although I loved the shell topper, I thought I could make it even more 'treasure-like' with a bit of gold leaf! 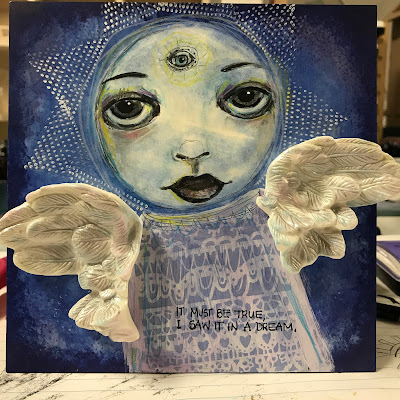 And to the back I added Relics and Artifacts® gold dresden wings and a hand painted watercolor angel with the word "intentions", using the RubberMoon my type alphabet! I loved every minute of this collaboration. Special thanks to Sandra, her R & A team, to our RM team and to YOU! *PLEASE watch our Facebook for this special piece to be auctioned!! I hope you've been enjoying the RubberMoon/Relics & Artifacts FUSE Collaboration as much as I have. Seeing everyone's posts has been so inspiring and incredible! And there are still many more fantastic projects to come. 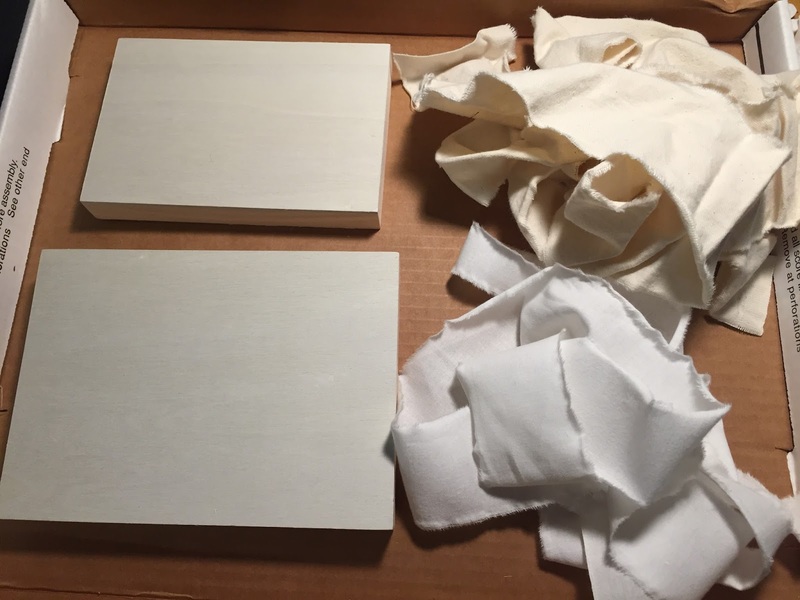 Today I'm sharing my piece of a 3-way collaboration with R&A team members Milagros Rivera & Sherry Matthews. We each chose an artist to represent. 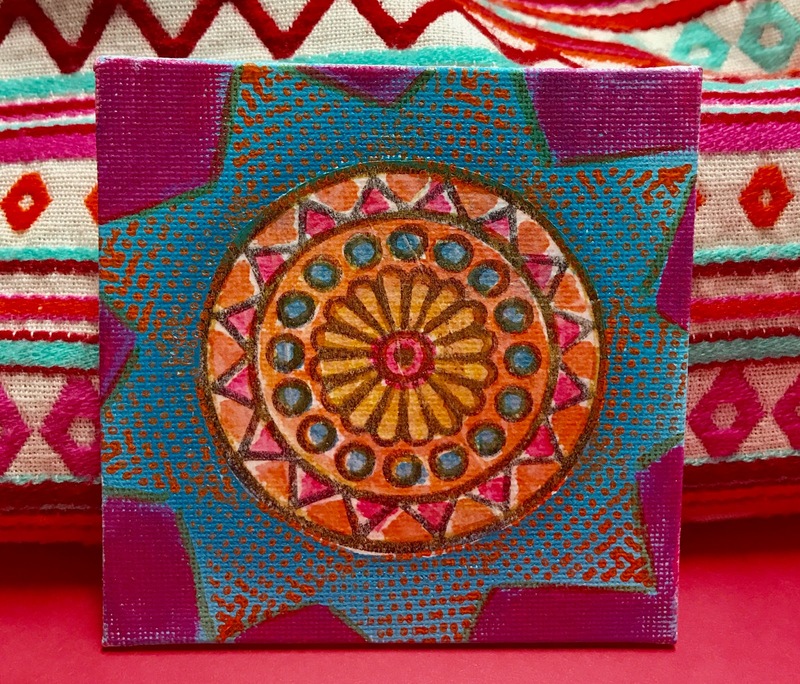 Yesterday you saw Milagros' amazing take on Frida Kahlo, and today I'm sharing my take on Vincent Van Gogh, one of my all-time favorite artists! So first for this piece I picked a quote from Van Gogh that I really think sums him up nicely: "I put my heart and soul into my work, and have lost my mind in the process." I chose a Relics & Artifacts piece (the hand) and made it hold a small paintbrush. On the back, I layered a copy of one of Van Gogh's works that I got out of an old art book I had on my shelf. The yellow dots of paint on the navy background inside the cradleboard are reminiscent of his painting Starry Night. 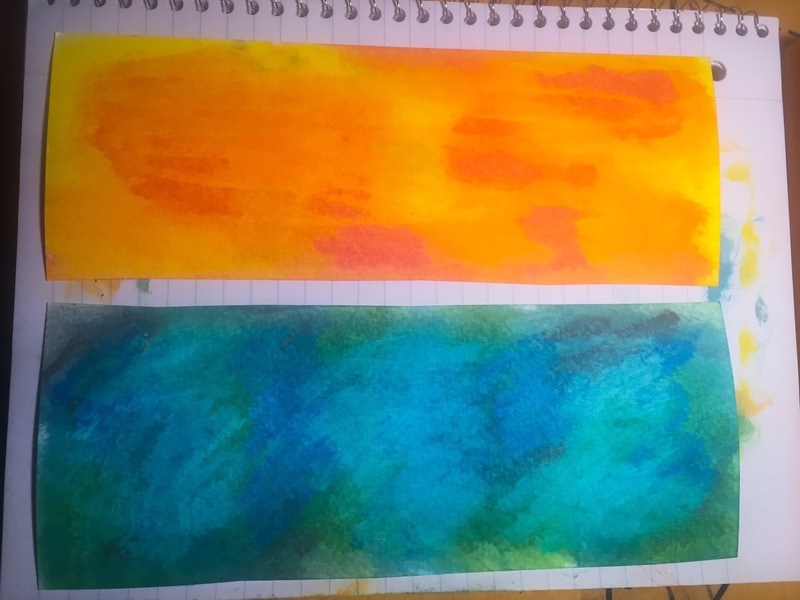 I hope you enjoyed this piece, thank you for visiting the blog today! Please stay tuned through the next week to see the rest of the incredible FUSE pieces! We worked on wooden trays as our bases and played with stamps and stencils to create our scenes. Darlene added rows of houses to the center so I thought it would be fun to add city buildings to the bottom. 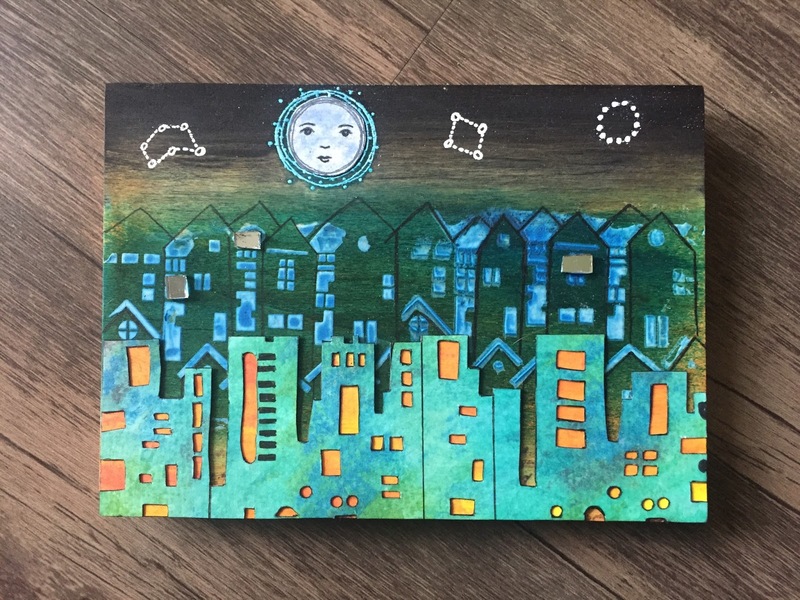 I started by adding some black paint to the top portion to make it a nighttime city scene. 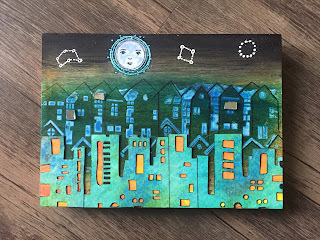 I played with Gelatos on watercolor paper then traced out the city stencil and carefully cut out the buildings with a craft knife. I also cut out the one with the warm tones to fit behind the buildings to show through the windows. I glued it to the bottom edge and cut off the excess. Then stamped and white embossed a moon and stars in the sky. Stamped the moon also on watercolor paper with black ink and colored with colored pencils. 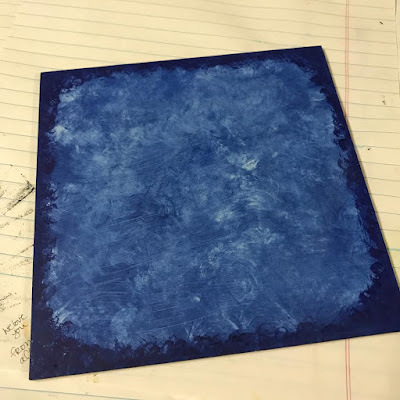 Cut it out and glued onto of the embossed image. 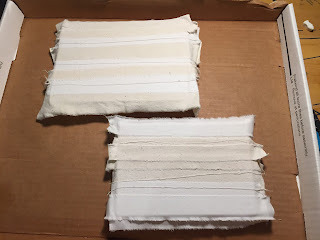 To start country I painted to wooden tray with a coat of gesso, then glued on strips of torn cotton fabrics with PVA glue to add texture. 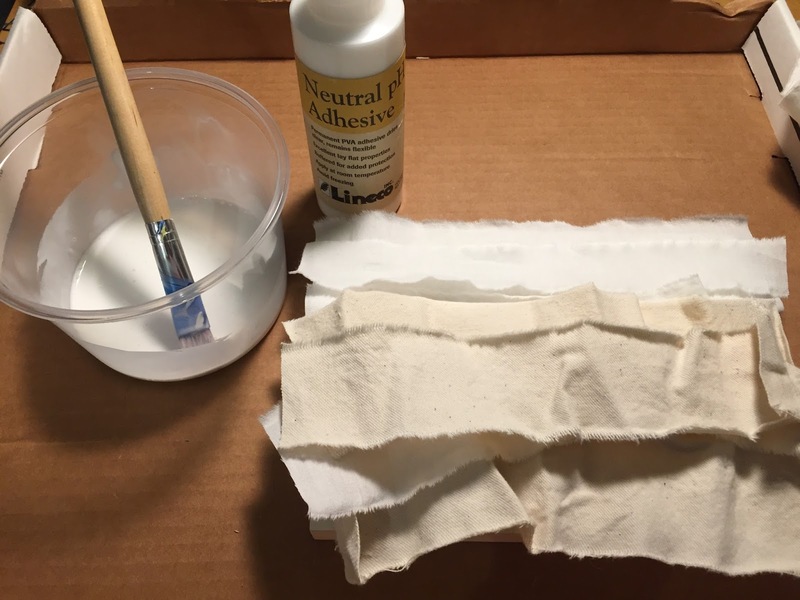 Once dry I trimmed off the excess fabric and then used the Celestial Sea stencil with Texture Paste. I glued on a butterfly from the Relics & Artifacts Papillion set, and did one more coat of Gesso before I mailed it off to Darlene. I partnered with Rochelle Kretz Gaukel on this piece, "A Little Birdie Told Me." Rochelle sent my way a beautifully layered and painted backdrop complete with metal working. I used RA: Finch for the centerpiece of my hand in the project. I used Golden acrylic paints (bright blue and copper). I also used small beads of all colors to weave strands among the metal grid of my art partner's cage. Initially, I was going to nest the finch at the base of the cage, but I didn't want to cover up the lovely collage work that was created for me. So I had the finch emerge from her cage, outstretched legs and all! 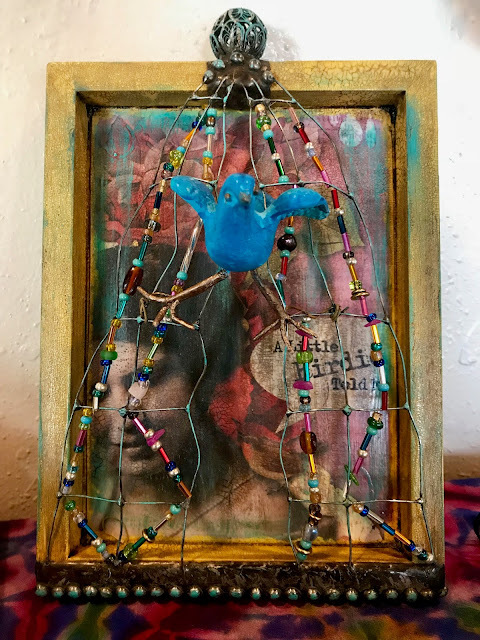 Because she had shaped a cage, I decided to forgo the idea of creating a nest and instead perched my bluebird emerging from its cage. I then wove strands of beads throughout the layers of cage to add further bright colors to the piece. This was such a fun piece to work on!